As you can see from the “before” fly-over, our farm came with a lovely farmhouse, but not much else! Certainly not enough considering we’re totally off-grid in terms of power, water and sewage. So while we’ve started planting out the first few patches of the edible forest garden, the focus has been on getting the basics of farm infrastructure in place. The centrepiece of these efforts has been the new farm shed (aka “the barn”). The local council required us to position it away from the road, so it ended up half-way down a slope. Echoing the design of an American barn, the shed is 10.5m wide and 7m deep, with a big 3m x 3m central door for the tractor. Since the barn is now in the middle of a field, a new internal driveway was required. Befitting the location of the house, we decided to go all-out to create a pretty road. This meant a road surface of crushed granite (on a solid road base), with brick edging (on a concrete edge laid alongside the full length of the road). With Priscilla’s keen eye for aesthetics, we laid the road out with elegant “swooping” curves. We put a single car-parking spot in front of the house, plus a large parking area in front of the barn. The final phase was the addition of two 22,000L plastic water tanks below the barn, to catch the run-off from the roof. This triples our overall water storage. The new tractor, which turned out to be a tight squeeze in the barn! One final water tank on high ground, which we’ll switch to using for the house, plus the garden. That will get us up to about 100,000L in total. A water pipe laid from the barn tanks (at the bottom of the property) to the new water tank (at the top), with a solar pump used to get the water up the slope. A power line run to the final tank, for a good-sized pump. A vegetable patch and greenhouse, with a water line run from the tank. This entry was posted in Lewisham farm, Uncategorized and tagged farm, road, shed, water tanks. It’s coming up on eight years since we installed our first 5000L water tank, put in during drought conditions. Since then we’ve added two more tanks as part of the renovation. Over Christmas, when we had three dry months, our tanks dropped to nearly empty. They also started to stink, clearly the results of anaerobic decomposition of the plant material washed off our roof. Smelly water feeding into the washing machine, not good! Our setup has first flush diverters, designed to capture the first lot of dirty water that flows into the gutter. They’re not magic, however, and gunk still gets in to the tanks, and builds up over time. In the country, where households have to rely exclusively on their water tanks, it’s routine to get them cleaned out every while. I haven’t heard of it being done in the city, however. This might be because most of the tanks were put in at the same time as us, or later, and the problems are only now starting to emerge. When we were out at a country show, we collected a business card from Leigh’s water tank cleaning, who we talked into dropping by our place when he happened to be heading into the city. We also talked to the Water Tank Cleaning Company who operate throughout Sydney (their website was down at the time of posting). Leigh was very friendly, the the process is surprisingly simple. It’s basically a hand-manoeuvred version of a pool cleaner, which is steered around the base of the tank where the gunk has accumulated. It’s somewhat horrifying to see how much dark brown water gushes forth. No wonder our water filters kept getting clogged up, trying to deal with all that! This entry was posted in Local issues, Renovating the house, Useful resources and tagged water, water tanks. The news is that Sydney Water has decided that it doesn’t need to save any more water, and that programs for schools, businesses and schools can be shut down. It’s an extraordinary decision, made with the full knowledge that Sydney will only be getting drier in coming years. Our house was the featured “human interest” angle for the story, and a video person came around yesterday to film me watering the garden and talking about why we put in our water tanks. All good fun! This entry was posted in Saving the environment and tagged water tanks. The big advantage of this watering approach is that practically no water is lost to evaporation, as it all goes sub-surface. It also encourages plant roots to seek downwards, strengthening them again dry and hot days. It’s robust against blockages, as any sediment simply falls to the bottom of the water spike. This creates a ‘watering unit’, when then connects to standard 4mm polypipe (used for drip feeds, etc). I’ve seen the ‘carrots’ available per piece in Bunnings, along with the other required bits. You can also get them in bulk at Reece. Combined with a timer system and a network of 19mm polypipe, this is a great set-and-forget watering system for all our plants. We love it, and would recommend it to others. The water spike in place, attached to our 19mm polypipe network. This entry was posted in Growing our own food, Saving the environment and tagged irrigation, raised garden beds, water, water spikes, water tanks. It’s been a long time coming. As an “inner-city farmer”, rain becomes an important thing, closely watched and hoped-for. The main vege patch has a watering system, but the tanks ran dry a week ago (all 10,000L), forcing us to switch to mains water. The food forest at the back relies on rain. And there hasn’t been rain of substance for six months now, leaving the ground parched and the plants struggling. Finally, it rained last night, as shown above. And it’s kept raining today, heavily at times. Rain on Christmas Day, not normally considered a good thing … but great for the plants. We’re relieved. This entry was posted in Growing our own food and tagged rain, water tanks. A grey, rainy day … and perfect timing to get our last tank installed. One of the first things we did when we purchased the house was to put in a water tank, to allow us to grow our own food despite the water restrictions in place at the time. The renovation gave us an opportunity to expand our water capacity. The easy step was putting in a second 3,100L water tank in beside the first, at the side of the house. Since this one could just be connected to the existing tank, it’s pretty cheap (no pumps, plumbing, etc). The last water tank was a slimline tank, put in to address our overflowing gutters. With the extension finished, we had 150 square metres of roof feeding the back gutter, and with a single downpipe, it would get overwhelmed in heavy rain. The slimline tank on the other side of the house allowed us to put in another downpipe. 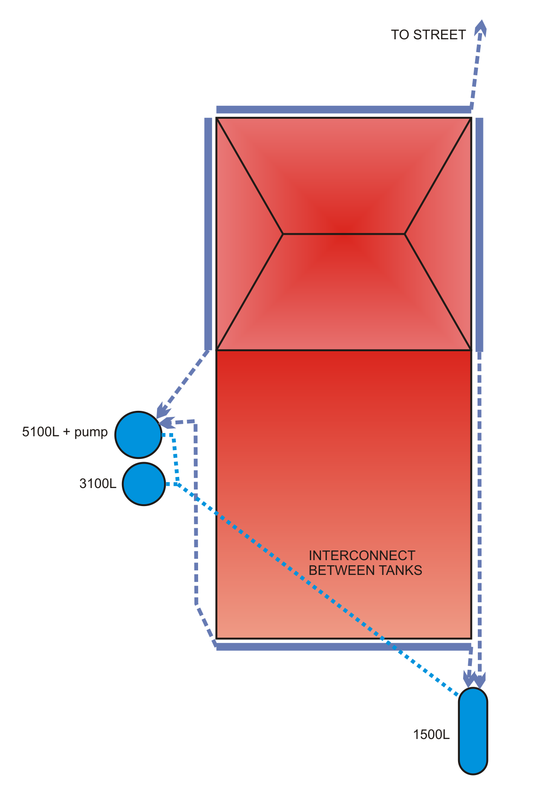 By connecting the new tank to the existing tanks, the water level equalises between them, adding 1,500L to the total capacity. So that’s 9,700L of water capacity, split across three tanks in two different locations, with just one pump. Not too bad! This diagram shows how it all fits together (click to see a larger version). This entry was posted in Renovating the house, Saving the environment and tagged gutters, water, water tanks. Marrickville Council has organised another Water Sustainability Urban Design (WSUD) tour in the local area, and we’re one of the stops. The purpose of these tours is to show local residents some of the many ways of saving water. In our case, it’s our water tank, irrigation system, and permaculture garden sufficient to meet our vegetable needs. To book, download the poster, ring Marrickville Council on 9335 2222, or email water@marrickville.nsw.gov.au. This entry was posted in Saving the environment and tagged irrigation, marrickville council, water, water tanks, wsud.